So, a couple of weeks ago, we had a travel writer in town, Caroline Eubanks, and we took her to see all of the sites in Columbus but our adventure actually started at a place in Buena Vista, GA called "Pasaquan." If you've lived in this area for a while, you've probably heard of Pasaquan and the guy who came up with this place and the got-to-see-it-to-believe-it home and compound there. His name was Eddie Owens Martin and he was a folk artist, not to mention a street hustler, drag queen, bartender and gambler when he lived in New York. Martin eventually returned to Georgia, where he renamed himself St. EOM, the guru of Pasaquan and boy, did he stand out in his colorful flowing robes, adorned with jingling bells and dangling shells. 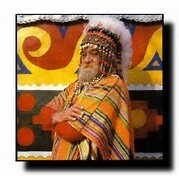 He often complimented his inspired ensemble with feathered and beaded headdress. Am I painting the picture here for you? This guy was very talented and just a tad bit eccentric. For the past couple of years, a huge renovation project has been taking place at Pasaquan to take it back to St. EOM's original vision...and colors! The center will re-open officially on October 22, but in the meantime, the Columbus Museum (1251 Wynnton Rd.) has a great exhibition showcasing just the tip of the iceberg of this guy's talent, and let's face it, wacky take on reality! Not just an artist, but there's even a great story about him going into town to get more paint at the hardware store and all 12 of his cats would pile up in his station wagon and go with him. When he got to town, he'd open the door and the cats would go running in 12 different directions, but when it was time to go home, he'd sit in the car, do some kind of meditative chant...and the cats would come running. Um..ok. So go check out the cool stuff on display at the Columbus Museum...that way you'll be prepared for what you'll see at the grand re-opening of Pasaquan in October! This is St. EOM...and that's what I'd call a unique kind of guy!